We live in the age of the mobile majority. Where once Mary Meeker was quick to highlight the disconnect between the time consumers spend with mobile devices and the amount of ad spend devoted to the medium, news last month from the IAB that mobile display ad spend in the UK has finally overtaken desktop, suggests that this balance is now being redressed. Furthermore, with the programmatic trading of mobile inventory on the rise and half of all mobile display activity being accounted for by rich media formats, there are also clear signs that automated trading practices and creativity are not as mutually exclusive as they were once thought to be. Programmatic advertising in the mobile space can provide a rich platform for delivering and optimising highly creative brand-driven messages. What is it about mobile creative that’s going to resonate with consumers? The answer lies in driving an emotional response. Across the 47,000 interviews completed over the course of 170 campaign effectiveness research studies, On Device Research has proven that those ads that achieve the highest emotional reaction amongst consumers drive between a 4-percentage point and 12-percentage point uplift in brand metrics. The crucial role that emotions play in ad creative is a long-established fact of advertising theory. Pringle and Field’s analysis of the IPA databank has shown us that emotional campaigns are twice as effective as rational campaigns, while Daniel Kahneman’s oft-quoted theories on the human decision making process point to how the use of emotion appeals strongly to our brain’s system one. 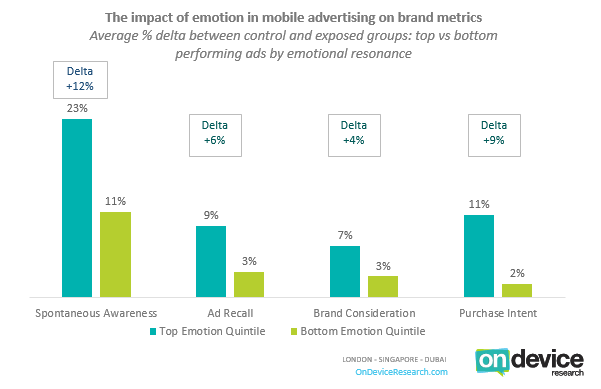 For the first time in the mobile space however, On Device Research’s mobile effectiveness database has proven that there is a robust link between emotions and brand effectiveness. Mobile ads that elicit a positive emotional response work harder. They stick in the mind and create more deep routed neurological connections. The top 20% of ads that perform well in terms of emotion, on average drive spontaneous brand awareness scores that are 12-percentage points higher and ad recall scores that are 6-percentage points higher than the bottom 20%. Measures closer to the harder end of the branding funnel perform well too, with the top emotion performing mobile ads not only driving a 4-percentage point uplift in brand consideration, but a further 9-percentage point boost to purchase intent as well. As the author Colin Shaw pointed out in Mediaweek this month, the link between emotion and brand loyalty is a strong one. This relationship is now clear in the age of the mobile, and through ongoing campaign tracking, measurement and optimization the branding rewards of mobile can now be fully realised. Branding on mobile works. Not only that, but ads that play on the emotions work harder than the rest. When it comes to mobile branding, don’t be afraid to show your emotions!